Croplands Equipment offers a range of agricultural and horticultural crop sprayers with multiple advantages for farmers and growers. 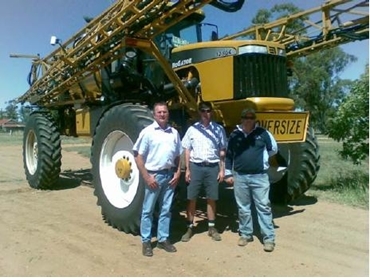 When Gilgandra, NSW farming mates David Jackson and Darren Murray struck up a conversation on cost efficiencies of chemical spraying earlier this year, they settled on one conclusion. The sprayer the pair settled on was a Croplands RoGator 1286C boomsprayer complete with 36m boom, auto guidance, auto boom shut-off, auto boom height control and mapping. The RoGator 1286C boomsprayer also met the requirement of good underframe clearance. “That’s the reason we went for an SP because I do a lot of late foliar applications in crops like chick peas, canola and sorghum and the SP doesn’t knock the crops around,” David said. According to David he could expect to complete 400ha a day with the truck sprayer. With the RoGator 1286C boomsprayer, he easily achieves between 600ha and 700ha a shift averaging around 60-65ha/hr, depending on conditions at an operating speed between 20 and 25km/h. David likes the six-speed range transmission, which allows multiple on-the-go gear selection to match operating speed. The 1286C comes with a standard air-suspended seat with fore-aft isolators and reclining lumbar adjustment. Sound-suppressing insulation also deadens noise from the engine and equipment to further enhance the cab environment. Other features include 3-way dome lighting, auxiliary radio mount, in-cab storage and triple auxiliary power outlets for mobile phones and electronics. All system functions including the throttle and hydrostatic control are in the right hand console adjacent to the operator’s seat while the hydrostatic control handle puts the most frequently used controls at the user’s fingertips. As a contractor, reliability is a key issue and David gives the 1286C the thumbs-up in that department. Apart from the advantages of guidance, night work is easier with six halogen work lights operating off two maintenance-free batteries and a 160amp or optional 200amp alternator. Optional HID lighting provides even more lighting availability. The 1286C has been designed not only for comfort and performance but also for safety. A mixing vat is located at a convenient height at ground level, eliminating the need to lift chemical drums while entry to the cab is via a ladder and flat deck with skid-resistant surface and handrails. The ladder automatically retracts when the parking brake is released and extends when the brake is applied.